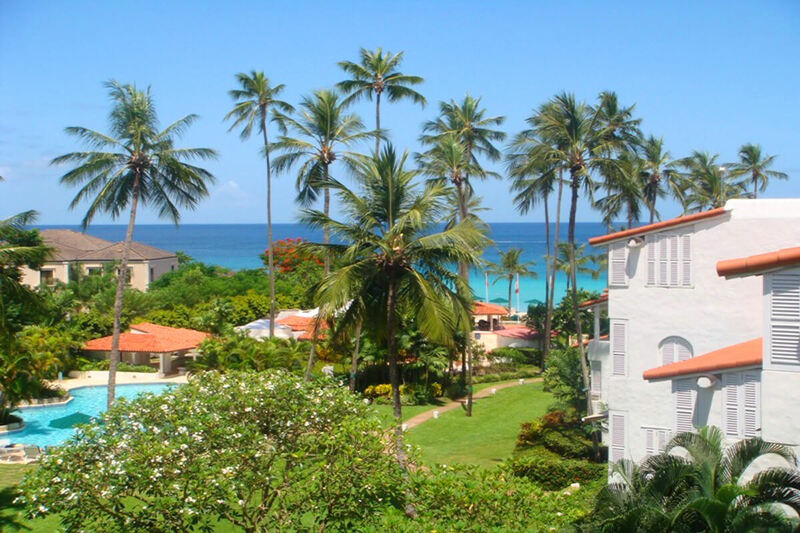 Located on the famous West Coast of Barbados, Glitter Bay is one of the premier resorts on the island. The Sea Turtle Penthouse, #313, is a spacious apartment within the resort with everything you need to make your vacation memorable. The 3 bedrooms, 3 en suite baths, huge kitchen, and roomy living and dining areas can comfortably accommodate up to 6 guests. There are also 3 balconies that overlook the gardens, pool, and the beach and sea beyond. The beach, with its comfortable lounge chairs for sunbathing, is just a couple of minutes away on foot and is great for swimming or snorkeling. Holetown is only a 5-minute drive from Sea Turtle, so it’s easy to dine out or spend the day shopping. Situated among the gardens of Glitter Bay, you will find these comfortably appointed one-, two-, and three-bedroom apartment beach front condos, which make an ideal holiday home for families, couples, or friends traveling together. The all-suite property, formerly The Fairmont Glitter Bay Resort, is located on one of the best beaches on the west coast of Barbados and is next door to The Fairmont Royal Pavilion. Each unit is tastefully furnished and comes equipped with all modern conveniences. The Glitter Bay Suites location is close enough to Holetown that you will be near many casual restaurants, beach bars, and fine dining establishments. Also nearby are shopping malls, banks, supermarkets, the post office, and 24-hour convenience stores, making Glitter Bay an ideal base for your Barbados holiday. Glitter Bay Suites 313 Sea Turtle Penthouse is a three-bedroom split level apartment. This unit has been remodeled and refurbished and has approximately 2,200 square feet of living area with three balconies. The bedrooms are all air conditioned with ceiling fans and all have en suite baths. One bedroom is located downstairs and has a king bed, tropical dark wood furnishings, lots of cupboard and drawer space, and leads out to a balcony which has views of the gardens, pools, and the ocean. There is an LCD TV with cable. The en suite bathroom has a tub and shower combination with a granite vanity. The second bedroom is upstairs and has a king bed and an LCD TV with cable and leads out to a balcony as well. The bathroom is the same as the lower level one. The third bedroom is also upstairs and has two twin beds. There is also an LCD TV with cable and access to the third balcony. The en suite bathroom is the same as the others. The living area is fully air conditioned and has a ceiling fan for guests’ comfort. The kitchen has granite counter tops and every appliance you’ll need for meal or snack preparation. The fridge is spacious, and the kitchen is also equipped with glassware, crockery, cookware, cutlery, pots, pans, bakeware, and kitchen linens. Here you can prepare your own gourmet meals or let the nearby patisserie in Holetown prepare your meals and deliver right to your door. Alternately, being close to so many great restaurants, cafes, and bistros, you can opt to dine out for any meal. There is also a bar area which is perfect for mixing up some exotic rum cocktails or other drinks. The living area has dark wood rattan sofas and armchairs. The entertainment area has a large LCD TV with cable, a DVD player, and a CD player. This is a perfect space for the family to spend time before retiring for the evening. The living area opens to a spacious balcony with a large 8-seat dining table which is perfect for enjoying your meals alfresco. This apartment also has a washer and dryer, iron, and ironing board for your convenience. All linens and towels are provided and beach towels are provided by the Concierge. The balconies have a great view of the extensive gardens, pool, and even a glimpse of the sea past the many towering coconut trees scattered on the property. Maid service 6 days a week 9 (off Sundays), daily concierge assistance 8.00 a.m. to 5.00 p.m., beach attendant, 24 hour, 7 days a week security, manned gatehouse, drinks bar with cable TV 11.00 a.m. to sunset, lunch snack bar 11.00 a.m. to 3.00 p.m. (seasonal), flood lit tennis courts, complimentary day use, racquet and ball rental available, childrens' playground equipment and play area by wading pool and table tennis table.